Each year, more than one million trees in the United States are struck by lightning. A lightning strike can immediately kill trees or weaken them so severely that they are then attacked and killed by boring insects or other secondary invaders. In some cases, lightning struck trees must be removed due to structural degradation caused by the heat and mechanical forces generated by the electrical charge. What many people don’t realize is that lightning not only poses a risk to trees, but to adjacent structures as well. Damage to structures can occur when lightning strikes a tree and then side-flashes (“jumps”) to more conductive materials such as downspouts and other metal objects. Houses with trees within ten feet of the structure and taller than the roof are most at risk to damage from side-flashes. 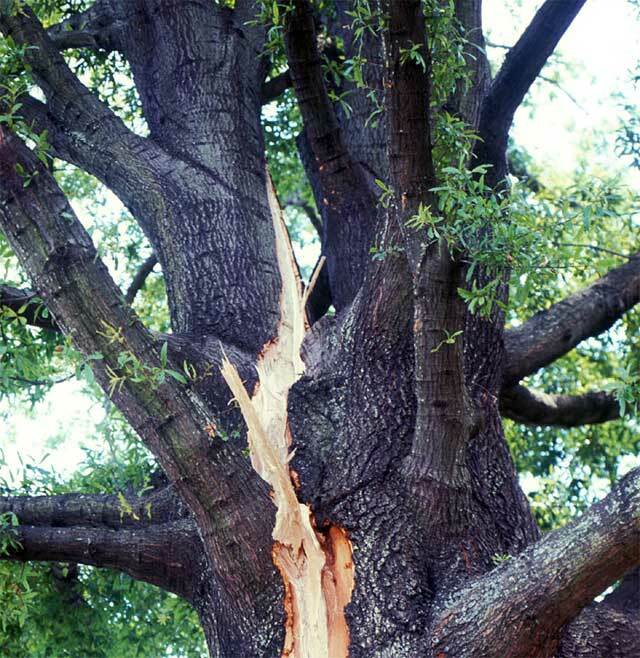 Bartlett Tree Experts offers lightning protection systems that can minimize the risk of damage from a strike. These systems use copper conductors connected to a ground rod to reduce tree damage and conduct the electrical charge to the earth where the energy is dispersed. Our systems have an excellent record of protecting trees and they reduce the risk of a side-flash to adjacent structures. In fact, lightning rarely damages trees outfitted with a system that has been installed in accordance with ANSI (American National Standards Institute) A300 Standards, which were adopted by The Tree Care Industry Association. While lightning strikes are unpredictable and protection cannot be guaranteed, systems are effective and affordable under these standards. Tall trees are obviously most susceptible to lightning strikes and certain species including tulip tree, oak, pine, and maple are damaged more often than others. Historic trees, those in feature locations in the landscape, and those close to structures are also candidates for lightning protection. Lightning protection systems should be inspected annually to ensure they are intact. Systems will require servicing to extend conductors and replace fasteners to accommodate growth of the trees in which they are installed. Lightning-struck trees should be immediately inspected by a Bartlett Arborist to evaluate the tree's structural integrity and assess its health. Trees that are severely damaged by a lightning strike should be removed immediately to avoid potential failures. If the tree is considered structurally stable and will remain in the landscape, certain treatments will aid recovery. Irrigate and mulch the root zone during dry weather to ensure adequate soil levels. Lightning strikes not only damage stems and branches but can also have a major impact on tree roots. Therefore, lightning struck trees are more prone to drought. Borer treatments should be considered to help reduce potential infestation. Fertilization and soil amendments should be based on soil analysis results.